There aren't that many of us "out there," that is, those hold outs who know there is no line where art ends and life begins. Life creates art. And vice versa. It's Nature with a capital "N," and all the other stuff we learned as undergrad English majors. 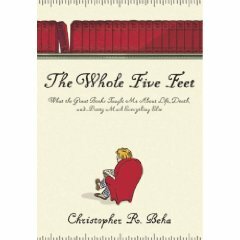 While I don't know Christopher Beha personally, having just finished his book I feel he's given me, and all his readers, a look inside the soul of a kindred spirit. The book he's written is such a treasure. I'm not sure it's what I'd expected, but then again, as he asserts near the end, it's not exactly what he'd intended to write, either. Several events came between him and that book, and what resulted seems a much more pensive work than he'd originally intended. Life-threatening illness and loss can do that to a person. Through his year of reading the Harvard Classics, Beha delves deeper into the roots of philosophy and literature than I probably ever will. Not saying I have a foot in the grave or anything. At least not that I know of. But I'd given up torturing myself for never having read most classical works sometime around the juncture where thirty meets forty (which wasn't that long ago, mind), after so many years of wanting and never quite getting around to doing. It had gotten to be too much a dragging guilt for me. I finally just felt I had to let it go. Reading his book gives me a taste of the experience of having read these great works, however peripheral it may be. It's intellectual voyeurism, and that may be my new favorite term. Be that as it may, and before I descend into my customary yammering, I'm sending Christopher Beha a few interview questions, probably tomorrow (mental note to me), but right now I'm reeling from trying to grasp everything I just read, knowing half of what I'd intended to follow up on has leaked out my ears. I better stop here. I really do need a vacation. I'm ranting at dead literary figures. That's modern life; there's so little time just to absorb. Everything's move, move, move, fitting in as much as possible within the space of 24 hours, wishing it were longer, ignoring the fact body and soul need the downtime of sleep, though doing more is all I really want to do. My head is full nearly to exploding; I'm already nearly the point of mental exhaustion. Thus, the mania of bipolar. Welcome! Anything less is just, plain boring. I think I'll put myself to bed now, if you'll excuse me. Take a look at Christopher Beha's book if you get a chance, and be on the lookout for my e-interview with him here in the near future. I may have mentioned it before, but I kind of enjoyed it. This one sounds fantastic. And intellectual voyeurism is my new favorite term!